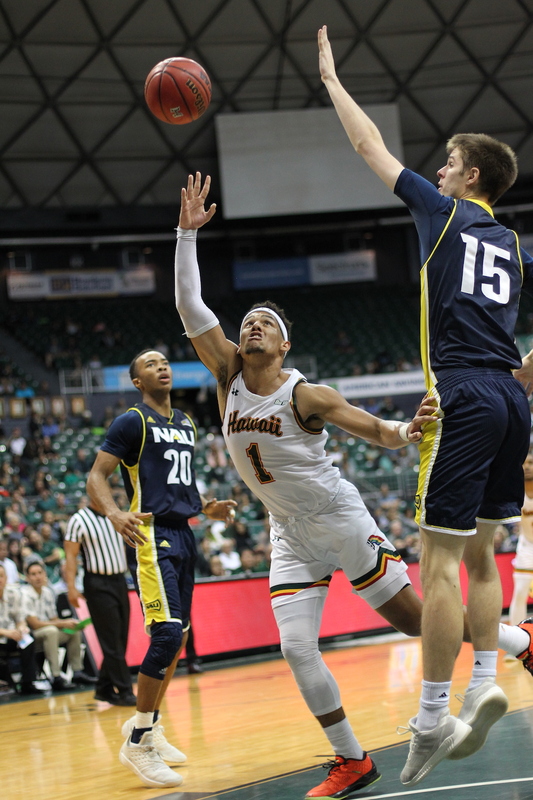 Inspired by its predecessors and also schoolmates from a different sport, the University of Hawai’i men’s basketball team bounced back strong from its only defeat and blew past visiting Northern Arizona, 85-68, in non-conference men’s basketball action. A sparse-but-engaged vocal crowd of about 2,600 watched Eddie Stansberry score a game-high 19 points — including five 3-pointers — off the bench and Zigmars Raimo add 17 points, four rebounds and three assists as the Warriors improved to 3-1 heading into the John Wooden Legacy Classic in Fullerton, Calif., Thanksgiving Weekend. Jack Purchase added 11 points and seven rebounds, Brocke Stepteau contributed 10 points and three assists and Drew Buggs finished with nine points, eight assists and four boards for UH, which will face Utah at 6:30 p.m. Hawai’i time Thanksgiving Night in a nationally televised (ESPN2) game at Cal State Fullerton’s Titan Gym. Carlos Hines scored a game-high 18 points and Bernie Andre added 12 points to lead the Lumberjacks, who fell to 2-2. Northern Arizona hung tough for most of the first half, using a 9-0 run capped by Cameron Shelton’s free throw to close it to 23-22 with 7:39 remaining in the first half. But the Warriors responded with an 18-3 run to close out the half and the Lumberjacks could not get closer than nine points the rest of the way. 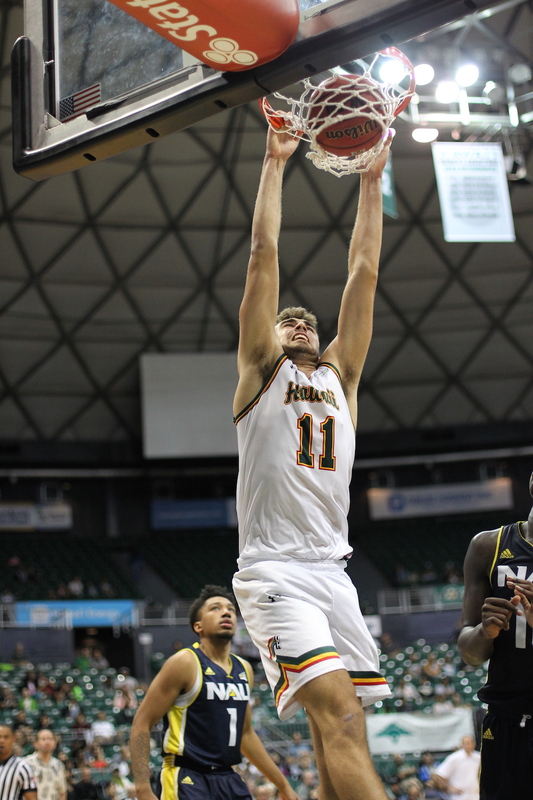 After NAU took a 7-6 lead on Hines’ driving layup with 15:22 left in the first half, freshman backup post Mate Colina answered with a short hook shot to start the Warriors on a 9-1 surge culminating in Colina’s layup off a Buggs assist to give Hawai’i a 15-8 lead. Samuta Avea later squeezed in a layup through heavy traffic under the basket to put the Warriors ahead, 21-13, midway through the half, but the Lumberjacks chopped away at the deficit and eventually closed it to one point at 23-22 after Shelton’s free throw at he 7:39 mark. But Raimo snapped the run by dropping in a layup 19 seconds later to start a 12-1 surge capped by Purchase’s free throw that made it 35-23 with 3:27 showing on the clock. After Hines drained a 19-foot jumper set up by a nifty jab step on the right wing to close it to 35-25, Stansberry finished the half by swishing back-to-back 3-pointers, the first from the left wing and the second from the left corner. On the defensive front, UH held Northern Arizona to 8-for-22 (36.4 percent) shooting in the first half, including just 2 of 12 attempts (16.7 percent) from 3-point range. The Warriors also literally kept the Lumberjacks off the offensive glass (0 offensive rebounds in the first 20 minutes) and out-boarded them 21-9 overall. Buggs said he and his teammates made a commitment to improve on defense, after a poor performance in the 68-51 home loss to North Texas on Nov. 11. NAU got as close as 59-50 after Hines’ layup with 7:49 remaining in the game, but Stepteau responded with a short banker on the other end to ignite a 12-3 run ending with Raimo’s free throw which made it 71-53 with 4:51 left, and the Lumberjacks could not get closer than 14 points the rest of the way. 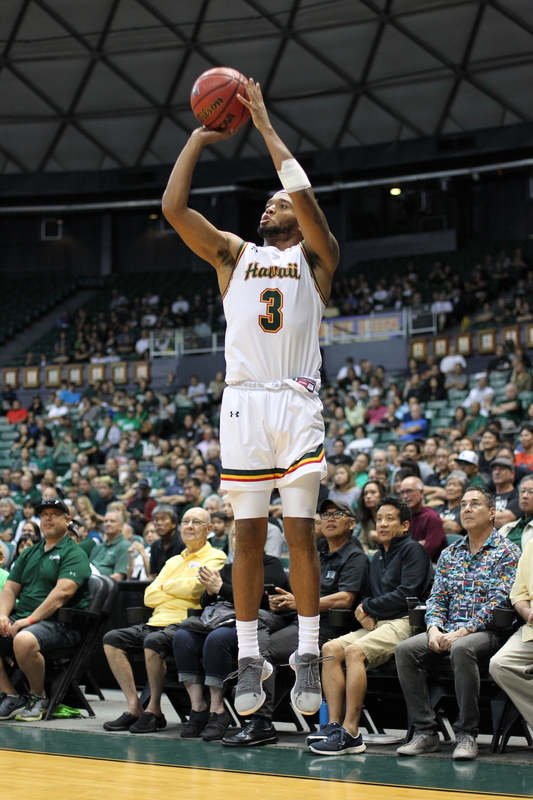 Ganot said his team — which donned special “retro” white jerseys with Rainbow trim from the 1990s era — drew inspiration from their attire and also from Saturday’s thrilling 35-28 fourth-quarter comeback victory by the Hawai’i football team over UNLV. Good game. They will get better. Looks like Owen Hulland is redshirting. Maybe mentioned before and I missed it. He may not be redshirting because he played in one game already. I like that Stansberry can shoot 3’s.Though Northern Arizona not great defending 3’s. He has to stay on court. Play smarter defense. Only teams at SSC that give Hawaii trouble Athletic good defenders and aggressive on offense. i.e. North Texas St. This 4 game road swing. Rainbows split would be fantastic heading into DHC. I think looking at bwc teams records so far. Warriors could compete hopefully for bwc title.